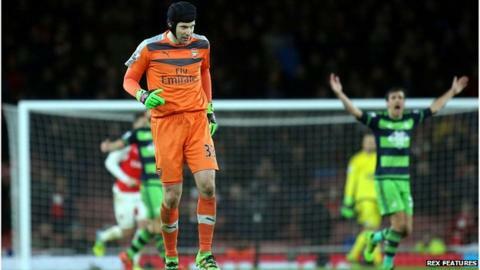 Arsenal goalkeeper Petr Cech will be out for three to four weeks with a calf injury, says manager Arsene Wenger. The 33-year-old is likely to miss at least four league games, plus the Champions League trip to Barcelona and FA Cup replay against Hull. He was injured when he ran back to his area after going up for a corner in Wednesday's 2-1 home defeat by Swansea. The Gunners are third in the table, six points adrift of leaders Leicester, and three behind second-placed Tottenham. Arsenal, who are trying to win a first Premier League title since 2004, visit north London rivals Spurs on Saturday.